Norton Security Scan is a free and easy-to-use tool that helps you to run a security scan. You can also run the scan automatically. By using Norton Security Scan, you can scan your computer and find out if your computer is infected with viruses, spyware, and other crimeware. If you find any threat on your computer, you can take appropriate action to remove the threat. 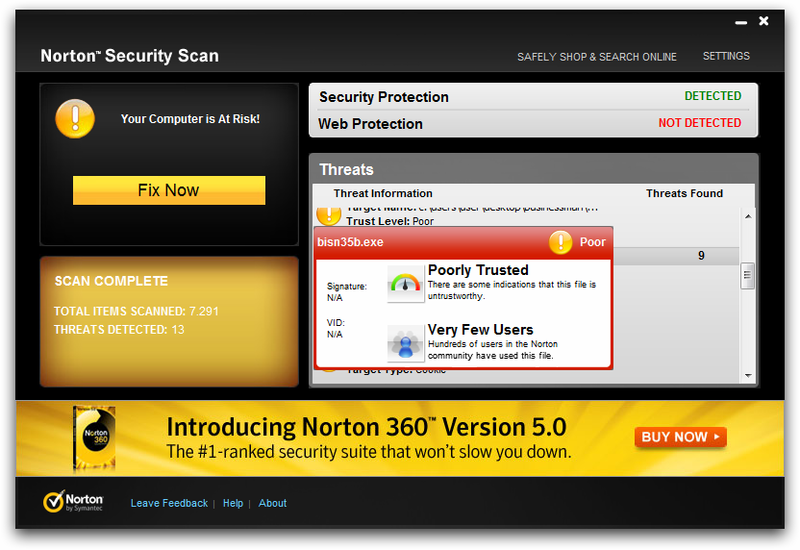 Please note, that Norton Security Scan is used only to detect security threats but not to remove them. This free tool will be useful, if you want to make sure that your computer is not infected — because the utility is fast, light and uses the virus definitions from Symantec, i.e. like Norton Internet Security. Paul Wood, Senior Analyst from Symantec.cloud, discusses the key findings from the June 2011 Report. „Despite the decrease in botnet spam this month, they should still be considered a dangerous force on the Internet. Cybercriminals continue to use botnets to conduct distributed denial of service attacks (DDoS), carry out fraudulent click-thrus on unsuspecting websites for financial gain, host illegal Web site content on infected computers, harvest personal data from infected users and install spyware to track victims' activities online”, — said Paul Wood. The new integrated report, the Symantec Intelligence Report, provides the latest analysis of cyber security threats, trends and insights from the Symantec Intelligence team concerning malware, spam, and other potentially harmful business risks. The data used to compile the analysis for this combined report includes data from May and June 2011. To download and install the Security Update 401 you need to run LiveUpdate feature of Norton Internet Security product. Please note that LiveUpdate definition identifier of Security Update 401 is 20110625.050 and its description was last modified on June 27, 2011 6:10:59 PM PDT. To download and install the Security Update 400 you need to run LiveUpdate feature of Norton Internet Security product. Please note that LiveUpdate definition identifier of Security Update 400 is 20110624.050 and its description was last modified on June 24, 2011 6:44:21 PM PDT. We all know that the world (especially in the tech world) is changing so fast that we do not even have time to see how these changes occur. And all that yesterday seemed to be an innovation tomorrow will be history — the history that is the basis for progress and future technologies. And probably, the software is one of the most rapidly growing areas where almost every day you can see „new changes”. In this post, I want to write a brief history of the Norton Internet Security, more precisely, the key features of this security suite, which were designed from its inception to the present day. In addition, I add a brief description of the product, the product box image and information about the press release, with which you can find more detailed use information. I hope this article will help you notice how Norton Internet Security has progressed and changed with each version, and also see the whole history of the Norton Internet Security, which comprises more than one decade — starting with Norton Internet Security 2000 until latest version.